I'm presenting another FREE webinar on breathing training on November 20th at 3pm GMT. The event is being hosted and sponsored by Human Kinetics and the British Association of Sport & Exercise Sciences (BASES). 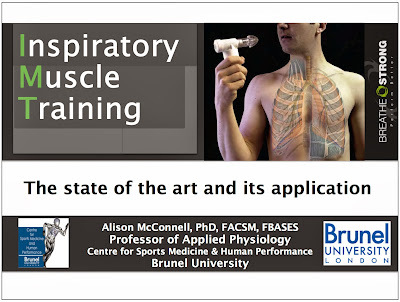 The title of this presentation is "Inspiratory muscle training: the state of the art and its application". Unlike many exercise-training methods in sport and physical activity, inspiratory muscle training (IMT) is now supported by robust evidence from systematic reviews and meta-analyses. Furthermore, substantial advances have been made in understanding how IMT exerts its ergogenic effects. For many though, IMT remains “too good to be true”, after all, how can something so simple possibly improve performance in only 4 weeks, with just 5 minutes per day of training? This webinar will describe the diverse roles of the respiratory musculature in sport, as well as the demands these muscles must meet. It will describe the evidence that IMT enhances performance in athletes, and explain the physiological mechanisms that underpin these changes. Finally, the webinar will introduce the emerging concept of “functional” IMT. To book your place just click on this link. Don't worry if you can't attend in real time, everyone who registers will be sent a link to view the webinar offline. In the meantime, if your itching to find out more about the benefits of IMT, visit Breathstrong.com.